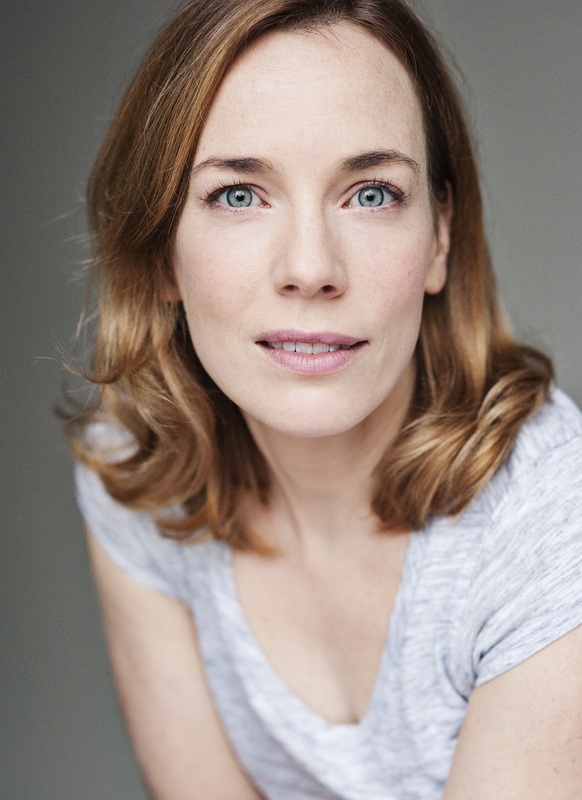 Scottish actress Laura Main is one of the stars in a hugely popular British TV show. 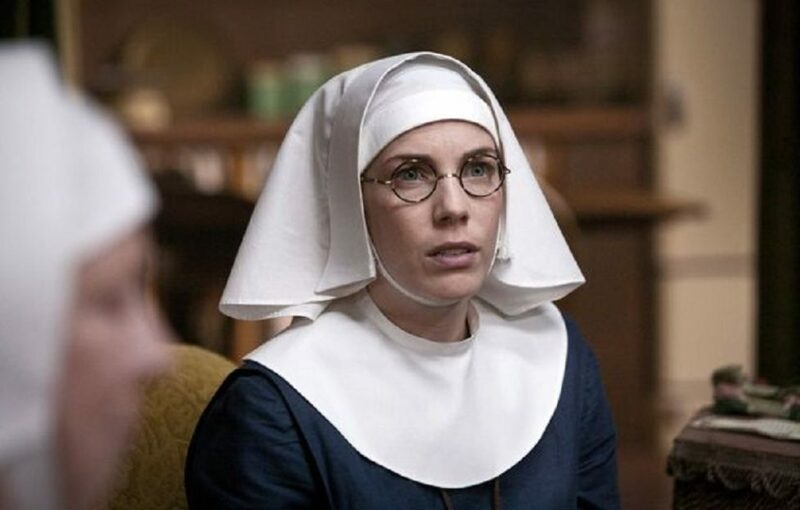 The Aberdonian stars as Sister Bernadette in the BBC1 drama series Call the Midwife. She tells Scottish Field about growing up, acting and being painted green… all in the name of her work, of course! You grew up in Aberdeen? Yes – born and bred in Aberdeen. I went to Hazlehead Primary and Hazlehead Academy and then I went to Aberdeen University actually so before I then came to London and went to Webber Douglas Academy of Dramatic Art, where I did my acting training, I studied History of Art at Aberdeen University. I made full use of the theatre scene in Aberdeen over the years. It was one of the big reasons why I actually stayed in Aberdeen – I had my sights set on drama school but I maybe didn’t feel quite ready at 18 to go to London, I also quite wanted to have something a bit more, pursue my academic career a bit more beforehand, just have something to have – to have flexibility further on and options, not just to put all my eggs into one basket in acting. The fact that there was this great theatre scene in Aberdeen with the student show. I was about 11 and I went to see my first student show and I turned to my mum and I said ‘I want to go to Aberdeen University so I can be in that.’ So, I did do that! I knew that if I stayed in Aberdeen that it would just take the pressure off financially – I could stay at home – if I was then going to do further training, I had to think about all of those things. Also just knowing that I had my dancing classes I was going to, I knew that there was this great student theatre scene, so I knew that by staying there I wouldn’t get distracted by moving to another city and not knowing where to start really. Do you still go back home? I do – it’s been a little tricky this year because when I haven’t been filming Call the Midwife, I’ve been on tour with Shrek: The Musical. So it’s been a little trickier this year. However, they came down to see us in Edinburgh, and we also did two weeks in Aberdeen and that was a real thrill – that was just lovely. Having done lots of shows there growing up over the years. I also once did The Sound of Music in Aberdeen which was a professional production – they took the Von Trap children from whichever city they were going to – it was this brilliant, beautiful production with an all-star cast, and I just remember being back stage and in the wings thinking, ‘Gosh, people do this for a living! This is their job!’ So, that was definitely when the seed was sown. But I’ve never really gone back as a professional really, so it was really special to finally get to do that this year with Shrek. But I’ve had a bit of time off between finishing Call the Midwife and going back into the show, so I made sure I went up to Aberdeen twice. It’s just nice to be home and to see everybody. My mum and dad are there, and I’ve got two sisters who have kids, so there are loads of reasons to head up. I was a bit of an all-rounder. I did like to throw myself into sport, art… I did enjoy school, it was really great. But for me it all sort of started out of school that I discovered acting. There was the Aberdeen Arts Carnival at the Arts Centre – I think it was about a week long and you could go and do all sorts of things. You could try your hand at an art class, music, dance, drama… and so I went along to these workshops and it was a great thing. It was the dancing that I really loved. I didn’t dance at this point and I remember doing a tap class – I had shorts and trainers on – I was completely new to it. But it was the dancing teacher Karen Berry who got me started – she was just unbelievably inspirational and encouraging – she’s a really special person. She goes above and beyond for all her pupils. She’s terrific. She said to me in the last class, ‘Are your mum and dad picking you up?’ and I was just at that age – I think it was the first time that I was getting the bus into town myself – it was a big moment, my mum still says ‘I actually can’t believe I let you do that!’ – so I said ‘No…’, and she said ‘I was wanting to speak to them afterwards’ and I thought ‘Oh no, I’m going to get into trouble here, what have I done?’ But then she just spoke with me and it was just to say, ‘You should think about doing this – I really think there’s something in you and you should give it a go’. I went home and I told my mum and dad this, but I said ‘But it’s got to be at Karen Berry.’ It wasn’t the nearest dance studio, my dad was going to have to drive me, and that’s what they did. Karen Berry was just an amazing person to meet because we then had these wonderful opportunities through her. She would see when there was something coming to His Majesty’s Theatre and she’d see if they were looking for children to perform. So the first thing I did was the Wizard of Oz and they were looking for some kids to play the munchkins. So that was the first thing, then as I say there was the Sound of Music. Then there is also the Phoenix Theatre, and they were putting on Annie and Miss Berry was choreographing it – it was those experiences that I got through her that was the thing for me. I enjoyed it so much – the rehearsals, putting on a show…everything I really enjoyed it. And it was all down to her. What was your favourite dance style with her? I’m tapping in Shrek: The Musical. That’s the one that I took to the highest grade. I always felt I was never going to be a dancer – I enjoyed putting on a musical where you got to do a bit of acting, dancing and singing, a bit of everything – I always knew I loved dancing but I always knew I wouldn’t be a dancer. But it opened up other things for me. How did you enjoy doing a Strictly Come Dancing special? Oh my goodness it was so exciting to get to do that! It was the Children in Need special for Call the Midwife cast members – there were four of us that did it. It was less than a week’s training, you were in the Strictly studios… I think my favourite bit was getting to come down those iconic Strictly stairs! The bit that didn’t involve me having to perform! It was terrifying but it was so great to be involved in that. It was back in 2015 – Craig (Revell-Horwood) actually said something quite nice! But I think they’re maybe a little bit nicer when you’re doing it for charity! How did Call the Midwife come about? It’s just been the most wonderful thing. I went along to the audition and it worked out… for it to take off in the way that it has and for it to connect with the audience in the way it has is wonderful. There’s a great director and an amazing team that you’re working with. I couldn’t have imagined that it would have got to Series 8 – I wouldn’t ever have hoped or dreamt that that would have happened, but it is just a really special job. I just absolutely love it and it’s just the nicest bunch of people. We all love making it. Series 9 is commissioned so hopefully we’ll be doing more next year. It’s lovely. It’s a tough business acting and there have been lots of quiet periods and I’m sure there will be again, but it’s just really nice to have this job that we just feel really proud to be a part of. Have you had any funny or particularly memorable moments when filming? Every day is different and that is what is so good about it. It’s a character that you play for a while and you get to know quite well, you’re working with your friends. But then every day is different. When I started here I was the young one! And I could not have imagined what I would have got to do. It’s lovely. I’m now quite a dab hand at scenes with lots of children in them! The birth scenes… helping film those! And feeling much more confident with what to do. We always have a midwife advisor with us to advise us. Some of the subjects we’ve had to tackle… my character is quite involved in the thalidomide episodes that we had one series – they’re quite memorable. They just felt really important. I love going to work, I really do! 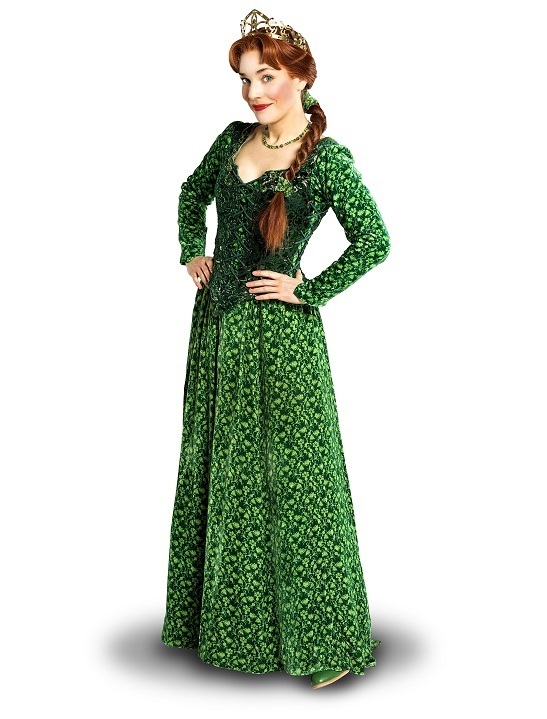 And, of course, you played Princess Fiona in Shrek: The Musical. It’s been a lovely year getting to do both of these things. It has been non-stop. I’ve never had a year as busy, and people ask me ‘How on earth are you doing it? !’ and I just think, you know what, I’m not going to have a year as busy as this ever again so I’m just going with it and enjoying it, and I feel lucky to be getting to do them both. How did you find the green paint and shifting from Princess Fiona to Ogre Fiona? It’s absolutely amazing how they do it. 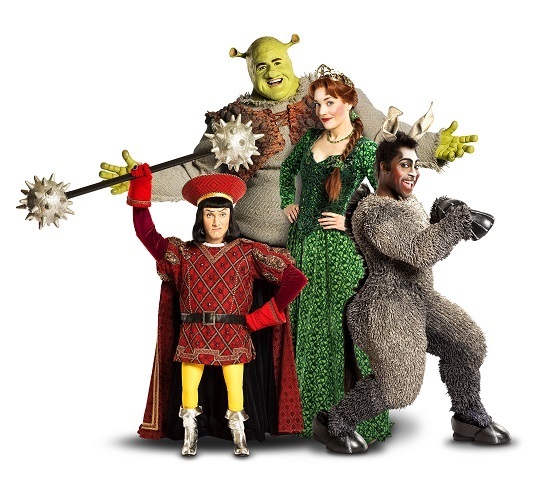 The guy that plays Shrek he has to – because he’s green the whole way through – he is in make up a good hour and a quarter before all the rest of us. For me it’s a little bit of princess make up and an orange wig for the majority. But there is – when you’re not on stage, it’s easy to start with. But I’m either on stage or I’m off stage changing size. So you are going back and forth! It’s only at the very end that you properly go green and it’s done with lighting up until that point. But at the very end, under about 60 seconds, about seven people help me transform and you’ve got your wigs, make up, sound, costume – it’s like a pit stop and it’s incredible. You wouldn’t believe it – less than a minute! I’m also last out the theatre because I’m green at the end! I find yoga really great for me. It’s a good way to relax. When I had a break I went and did a yoga retreat, so that is one of my fave things to do. I love – it’s like a busman’s holiday! – I love going to the theatre! I do love coming up to Deeside – we go on holiday there every year. We’ve done that for years. We did that growing up, and now that my sisters have kids we’ve started that tradition again. There’s nothing nicer than being out in the hills, going for a bike ride, walking… those kind of things reset you. That’s really important to do that when you can. You know some of those superheroes can move really fast – I’d like to be able to do that. It would come in handy with dancing!